It can detect the presence of Natural Gas and LPG in the air. The sensitivity threshold can be calibrated manually. Alarm signalling both visually (display) and acoustically (buzzer). Runs on a rechargeable battery. The reprogramming power supply allows connection to any kind of network. OBDII Diagnostic Hand-held used for viewing the working and diagnosis parameters of modern cars that use the OBDII (American standard) and EOBD (European standard) systems. The reprogramming power supply allows connection to any type of network. Testing unit for Feed-back units, Switches and Emulators. 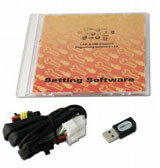 Reprogramming kit with USB pen drive for OBD Emulators and timing advance processors. 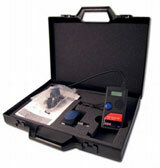 Device to find the negative of the injectors and the coil negative by means of a LED.